So your teen wants to make some money this summer? Or maybe your children want cash, and you've told them they need to work for it. Whatever your situation, here are some ideas and opportunities for your children to earn money over the next few months. The young ones (ages 4 to 10). Jobs to consider include raking leaves, gardening, taking out the trash and cleaning their room. Really, these are the allowance years. "Children as young as age 4 can benefit," says Pamela Yellen, author of "Bank on Yourself." "An allowance can help teach them how to recognize coins, though they're also more likely to lose them." Yellen is an advocate of tying allowances to chores. "The earlier children learn basic financial principles, such as the exchange of goods and services for money, the better," she says. Issues to consider. Safety, of course. If your child is going to set up a lemonade stand, a carwash or help run the family garage sale and interact with strangers, make sure you're around. Tweens and early teens (11-13). Kids of this age can do everything mentioned in the last category – raking leaves, yard work – and a bit more. Dog sitting might work out well or perhaps unsupervised or supervised baby-sitting, depending on your child's maturity and the age of the child being baby-sat. Lawn mowing is often cited as a good job for this age group, but the American Academy of Pediatrics recommends that children be at least 12 years old to operate a walk-behind power mower or hand mower. Kids should be 16 before operating a riding lawn mower, according to the academy. Issues to consider. The law. Even if your kids are mature, they generally can't work behind an actual counter, ringing up charges at a cash register. According to the Fair Labor Standards Act, as a general rule, you must be 14 before you can work as a full-fledged employee for a company. There are some exceptions, such as performing in television, movies, theater and on the radio. Most kids can work in family businesses, as long as it isn't mining, manufacturing or some other job that the U.S. Department of Labor deems hazardous. And there is no minimum age for delivering newspapers. Teenagers (14-17). According to a May 2014 survey of 800 parents by Upromise, a college savings service, three in five parents expect their teenagers to have after-school or summer jobs during the high school years. 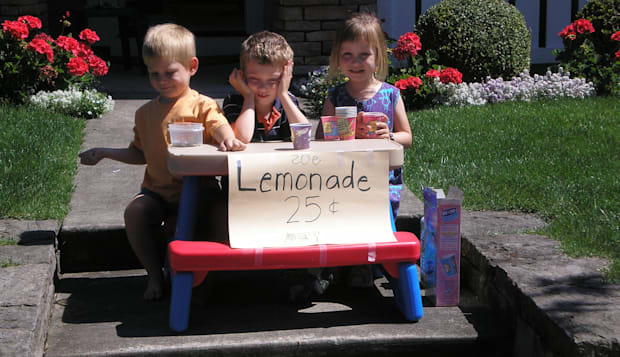 So if you have kids this age, chances are, they are actively looking for work. Your teen can theoretically apply for almost any job, but make sure it's safe and the company has a good reputation – in other words, use common sense. Retail and food service are popular industries for teens to make money. Jobs as lifeguards and camp counselors are nice for those who can snag a position. If your teen doesn't need the money, volunteering might be the way to go. Nadia Ward, an assistant psychology professor at Yale University who works with many disadvantaged youth looking for work, says summer jobs offer a host of benefits beyond the money. "For young people, they often need to develop soft skills, like relating to adults and developing important work behaviors like showing up on time," she says. Job interviews are also a great way to learn about the real world, Ward says. "They have to think about what they're going to wear, and young people can never be underdressed for an interview. They learn how to respond to questions, and the trick questions and the absolute follow-up with the thank-you note after the interview," she says. Just don't get too involved after your kid starts working, Ward cautions. That means if your teen has a beef with the job or boss, he or she should talk it out with the employer or manager – not you. "It comes from good intentions, but it's a big mistake," Ward says. "If a parent is always hovering and swooping in to rescue the child, it gives them the message that the young person can't think for themselves." Issues to consider. Everything already mentioned, plus taxes. If your teen gains employment, this will likely be his or her first experience with the Internal Revenue Service. But it shouldn't be a painful meeting. "There's no income tax for the first $6,100 [earned]. Your child still would potentially have Social Security taxes taken out of the paycheck, but otherwise, your kid wouldn't pay any taxes," says Dan Thomas, a certified personal accountant and personal financial specialist in Orange County, California. He adds that $6,100 refers to 2013 income, so the number may change slightly next year. While some kids may not pay income taxes, if they receive a W-2 form or a 1099, Thomas says they'll have to file like the rest of us. Of course, another issue is what your child does with his or her money. With any luck, you'll be able to persuade your teen to put some of it toward a worthy cause like college. Thomas says this would be the perfect time for a lot of parents to open an individual retirement account or Roth IRA, put some cash in to get their kid started (usually at least around $500, he says) and then have the teen put some of the money away. "You're never too young to start saving for retirement," Thomas says. But if you don't have the dough to set up an IRA or can't convince your teenager to start saving for retirement, don't berate yourself. While the advice is spot on, it's easier said than done, Thomas admits. He set up a retirement account for his 18-year-old son, who just graduated from high school and has a summer job in an attorney's office, making $10 an hour. Thomas, for now, is funding the account and doesn't expect his son to contribute this summer. Clearly chagrined, he says: "I'll never be able to get that kid to part with his cash."